Etafu Theme Use the Etafu restaurant website theme to show the family atmosphere of your restaurant. Build your brand online and increase your profits thanks to its integration with an online food ordering system. The Etafu Restaurant website theme from UpMenu The Etafu restaurant website theme is completely adapted to the needs of the restaurant industry. It will represent you on the internet and help you gain new clients. Use a simple CMS which supports UpMenu templates and customise the look of your Etafu theme to the brand image of your restaurant. And you can do it all for free, without the help of IT specialists. 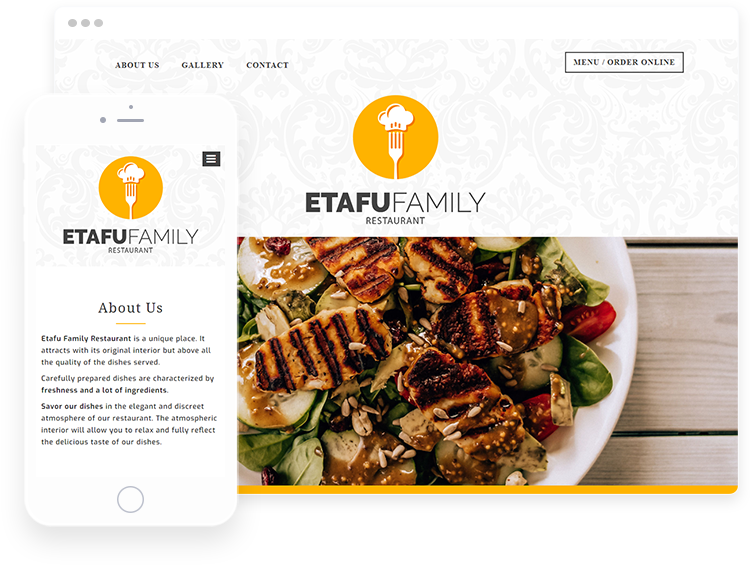 Great design The warm and welcoming Etafu restaurant website theme will highlight the family character of your restaurant. Show customers your interiors and the dishes you offer. CMS will help you. The active slider on the main page of the Etafu restaurant website theme will present the customer with a picture that best shows the climate in your restaurant - in a surprising way. Show your dishes Use the Etafu restaurant website theme to promote various types of cuisine on the internet. It works great as a restaurant website for a home or Italian restaurant. Present your dishes and show the unique atmosphere of the restaurant, thanks to the Etafu restaurant website theme. This template is great for showcasing the warmth of a family bistro. Run online ordering Each of the UpMenu restaurant website themes supports online ordering. Thanks to the intuitive layout, the templates direct your customers to a menu where they can order food delivery or the takeout service. The Etafu restaurant website theme is specifically built to help you earn money online. Simply run your online ordering system and increase your restaurant’s profits.